The Residences at Dockside is already a distinguishable building, but that’s not the only unique element about it. Outside, you’ll find Dockside’s very own public art installation, Open-Air Aquarium, which was created by the internationally acclaimed sculptor Magdalena Abakanowicz. 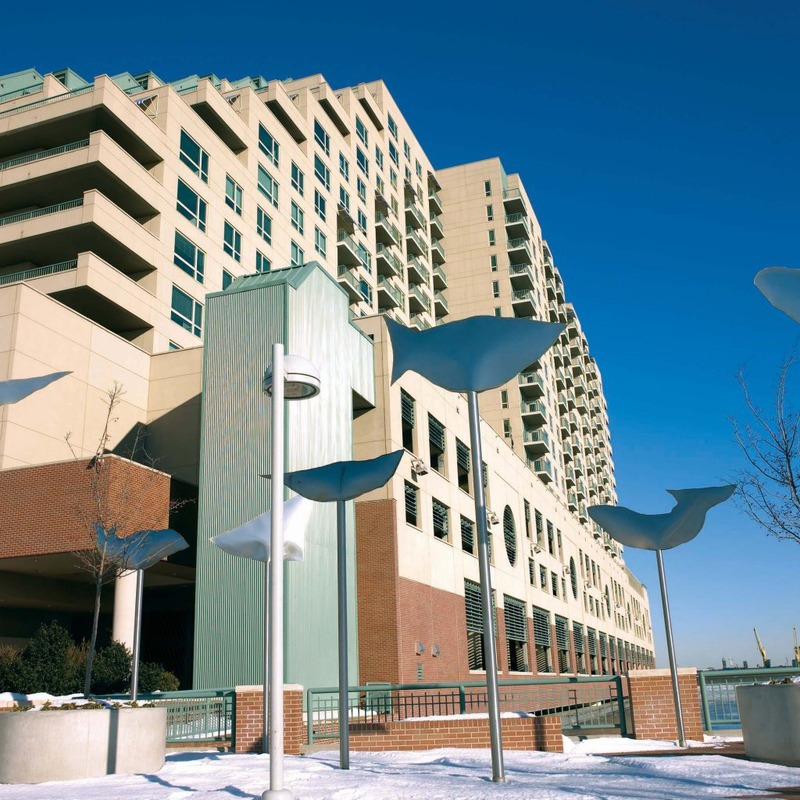 Installed in 2001-2003, the Open-Air Aquarium was commissioned by The DePaul Group, The Residences at Dockside’s parent company, in cooperation with Redevelopment Authority of the City of Philadelphia. 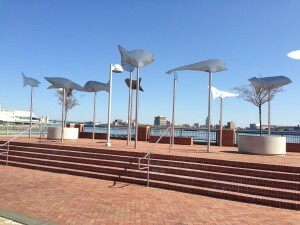 Completed in 2003, this abstract public art installation features 30 unique brushed stainless-steel fish that are mounted on 12-foot high stainless-steel poles that surround The Residences at Dockside entrance. This abstract public art uses textiles, which is the sculptural medium sculptor Magdalena Abakanowicz is known for. All of the Polish sculptor’s work deals with the issue of “the countless.” Whether it’s a crowd of people, a flock of birds, or a school of fish, Abakanowicz work focuses on “the mysterious assemblage of variants of a certain prototype, a riddle of nature abhorrent to exact repetition or inability to produce it.” To put it simply, quantity no longer makes sense because of unrepeatability within such quantity because the grouping or assemblage of said “prototype” is unique in nature or appearance making exact repetition unattainable while showcasing the inability to produce it as well. Magdalena Abakanowicz world-class art is not only thought-provoking, but it is also quite beautiful. 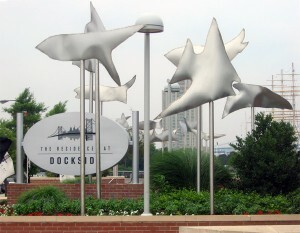 Her focus on fish blends well with the location of The Residences at Dockside on the river, and each unique fish is the perfect representation of Abakanowicz’s concept of uniqueness and nature’s inability to produce exact repetition. Now the next time you pass by the floating fish of the Open-Air Aquairum outside of The Residences at Dockside, you’ll understand and appreciate this special public art installation, knowing exactly what it’s supposed to represent. 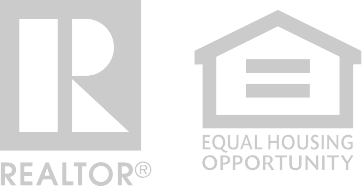 Live the Dockside life and contact us today for more information! We’d love to hear from you and welcome you into our friendly community that we’ve created here at The Residences at Dockside. Own the View. Own the Skyline. Own at Dockside. 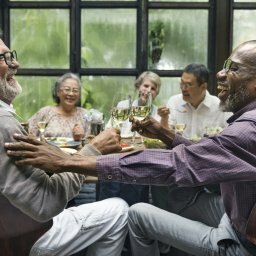 Philadelphia: One of the Ten Best Food Cities in America? Weekend To-Do List: Visit the Art Star Holiday Market! Support Our Neighbors in Queen Village!